De serie HETRONIC POCKET is ontworpen om de basisfunctiemarkt van professionele radiografische afstandsbedieningen te bedienen. Het is ontworpen op een beperkt aantal digitale functies te besturen zonder afbreuk te doen aan veiligheid en betrouwbaarheid. De POCKET biedt hoge betrouwbaarheid, hoge kwaliteit en is scherp geprijsd. Alle POCKET-zenders worden gevoed door 3 AA-Batterijen, waardoor ze tot 500 uur kunnen werken. Het slanke maar ergonomisch ontworpen profiel maakt eenvoudige bedieningen met één hand mogelijk. De uiterst betrouwbare membraanschakelaars zijn verkrijgbaar in enkele of dubbele snelheid. De behuizing is compact, maar robuust en er worden verschillende configuratiestandaarden aangeboden voor 'off-the-shelf'-beschikbaarheid. Zoals de meeste producten van HETRONIC, past de POCKET-serie voor een breed scala aan toepassingen. 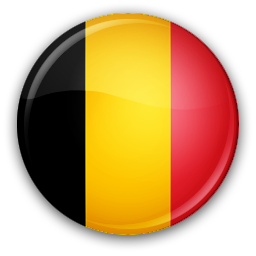 Het is ideaal voor kettingtakels, kleine bovenloopkranen, transportsystemen, monorails, haakladers, betonmixers, takelwagens, laadkleppen en vele andere machines. De POCKET-zenders zijn volledig compatibel met de reeks MFSHM-ontvangers van HETRONIC. 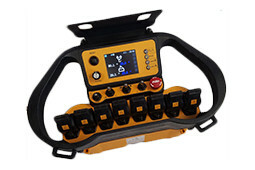 Designed to excel in the short range market, the HETRONIC HH MFSHL series controls a limited number of digital functions without sacrificing safety or reliability. The HH MFSHL is a straightforward workhorse offering the benefits of proven reliability, high quality and competitive pricing. All HH MFSHL transmitters are powered by 2 AA batteries, allowing for up to 500 hours of operation. The pistol grip design 'feels good' in your hand. The MFS feature allows up to 20 transmitters to operate in close proximity while sharing the same frequency.Operators don't worry about frequency management again. The rugged housing is compact, and available in several standard configurations, with off-the - shelf availability. Our highly durable toggle or membrane switches are always within thumb's reach. 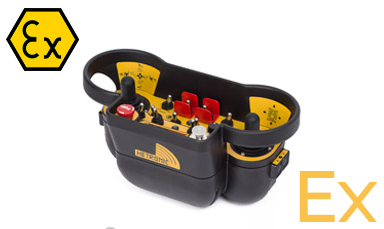 Like most Hetronic products, the HH MFSHL series fits a wide variety of applications. It's ideal for chain hoists, small overhead cranes, conveyor systems, monorails, hook loaders, concrete mixers, tow trucks, tailgates and many other types of machinery. 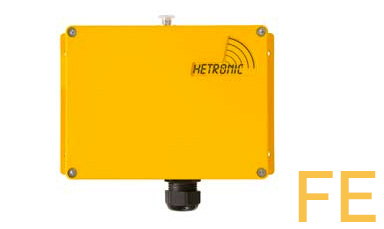 The HH MFSHL transmitters are fully compatible with Hetronic's line of MFSHL receivers. 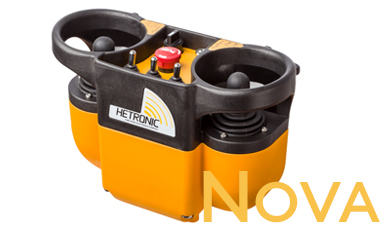 The Hetronic MINI is a small but powerful pushbutton transmitter that may be used for countless applications. It's designed for a market that requires a limited number of digital functions and it's durable. 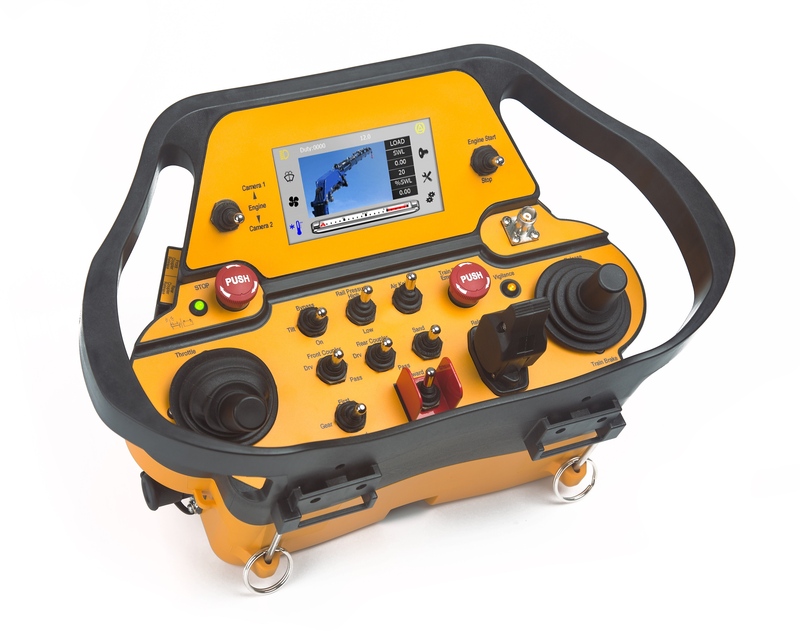 All MINI systems are designed to fit in the palm of the operator's hand. When it's not in use, the MINI can be worn conveniently on the operator's belt. 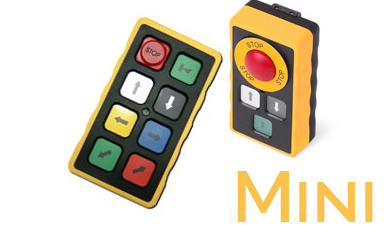 The MINI system offers durable single or dual-speed membrane switches to withstand the toughest environment. Hetronic offers the MINI in 6 different standards for quick delivery. It's powered by 3 AA batteries or by the optional rechargeable battery kit. 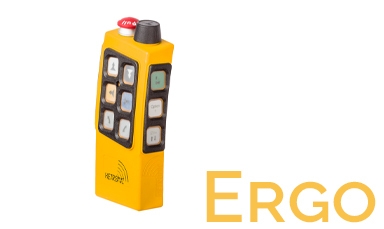 The HETRONIC ERGO F transmitter is the latest generation of the industry leading ERGO series hand held transmitters featuring 3 different standard configurations and customizable programming, Memory Key technology, a new ergonomic profile and easy remote setup. Memory Key technology allows the ERGO F to 'remember' your settings, lock out unauthorized use and even save settings in spare Memory Key Caps in the event of cap loss or damage. Comfortable and well-balanced, the ERGO F transmitter feels good in your hand.Its sleek profile offers precision control while reducing operator fatigue during all single-handed operations. With the advent of Hetronic's H-Link modem and software, manual setup is history. Remotely access and configure all of your settings using a PocketPC! 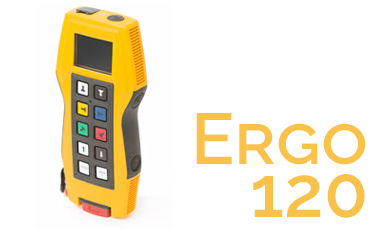 While used primarily with overhead cranes in the industrial market, the versatile ERGO F transmitter is also ideal for applications such as rock crushers, self-erecting tower cranes, boat lifts, mono-rails and more. The HETRONIC ERGO-MFSHL series is designed to serve the short range market of professional radio remote controls. It’s engineered to control a limited number of digital functions without sacrificing safety and reliability. The ERGO-MFSHL offers high reliability and quality at a competitive price.With several available standards, this lightweight and sturdy transmitter also offers the convenience of fully programmable functions via the Hetronic H-Link software. MFS technology: The MFS feature enables up to 20 transmitters to be operated in close proximity while sharing the same frequency. 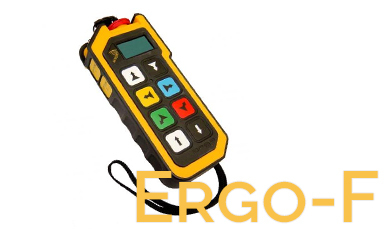 The HETRONIC ERGO transmitter is the latest generation of the industry leading ERGO series hand held transmitters featuring 3 different standard configurations and customizable programming, Memory Key technology, a new ergonomic profile and easy remote setup. Memory Key technology allows the ERGO F to 'remember' your settings, lock out unauthorized use and even save settings in spare Memory Key Caps in the event of cap loss or damage. Comfortable and well-balanced, the ERGO F transmitter feels good in your hand.Its sleek profile offers precision control while reducing operator fatigue during all single-handed operations. With the advent of Hetronic's H-Link modem and software, manual setup is history. 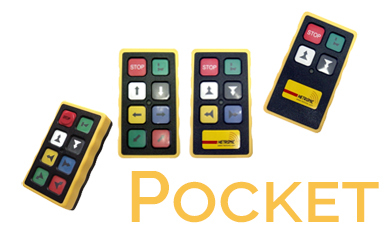 Remotely access and configure all of your settings using a PocketPC! 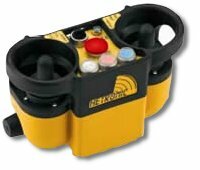 The HETRONIC TG pushbutton transmitter was originally designed for the industrial material handling market. 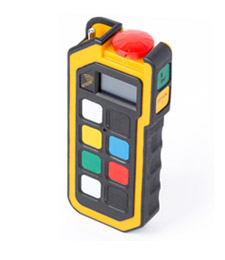 The TG transmitter allows for one-handed operation and provides the operator with the familiar pendant-control feel. The TG pushbutton transmitters are at home in steel mills and manufacturing facilities throughout the world. For many years, the unique feel and lightweight but rugged design of the TG transmitter has made operator's lives easier. The TG is typically used in standard configurations. However, it is also available in completely customized systems. Contact Hetronic and let our engineering staff tailor a TG system to fit your needs. The TG system is designed to fit well into the operator's hand. 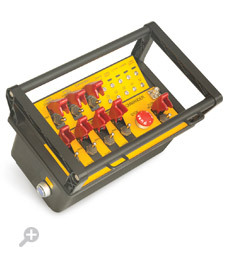 The TG system offers dual-speed push buttons as well as STOP and Key-Switch. Additional buttons for auxiliary functions can be integrated. The TG systems are commonly used in combination with Hetronic's RX 14-HL or RX 22-HL receivers. The HETRONIC NOVA family of transmitters sets the standard for today's industrial radio remote controls. The NOVA series impresses with its sturdy but attractive design while no compromises are made in regard to functionality and operator friendliness. Hetronic offers the NOVA series products pre - engineered and 'off-the-shelf' for the most common applications.However, the products are also available as customized solutions. The ergonomic and lightweight design allows operators to easily access control elements.The joysticks or paddle levers permit a smooth operation of the machine without operator fatigue. Lightweight and sturdy, the Nova-S is designed for applications requiring a limited amount of digital functions and is available with toggle switches or pushbuttons. When attached to the operator's belt, the Nova-S design assures freedom of operator movement while preventing accidental operation. The Nova-S is a favorite among operators in the forestry and concrete pump market. When used in combination with a Hetronic receiver, the Nova-S assures effortless integration of the machine circuitry. Small and sturdy, the Nova-M is sized just right to allow easy operation with gloves. No compromises are made in regard to functionality and smooth operation. The Nova-M is available with either 2 dual - axis joysticks(digital or proportional) or with 1 dual - axis joystick(digital or proportional) along with auxiliary functions. The Nova-M along with Hetronic's RX 14 HL Series or BMS-2 receivers assures effortless integration of your machine circuitry. The ergonomically-designed Nova-L impresses with its sturdy and attractive design. Operators enjoy easy access to control elements, and no compromises are made in regard to functionality and smooth operation. The Nova-L is available with either 2 dual - axis joysticks(digital or proportional) or with up to 6 fully - proportional paddle levers. The Nova-L along with Hetronic's BMS-2 or modular-design receivers assures effortless integration of your machine circuitry. 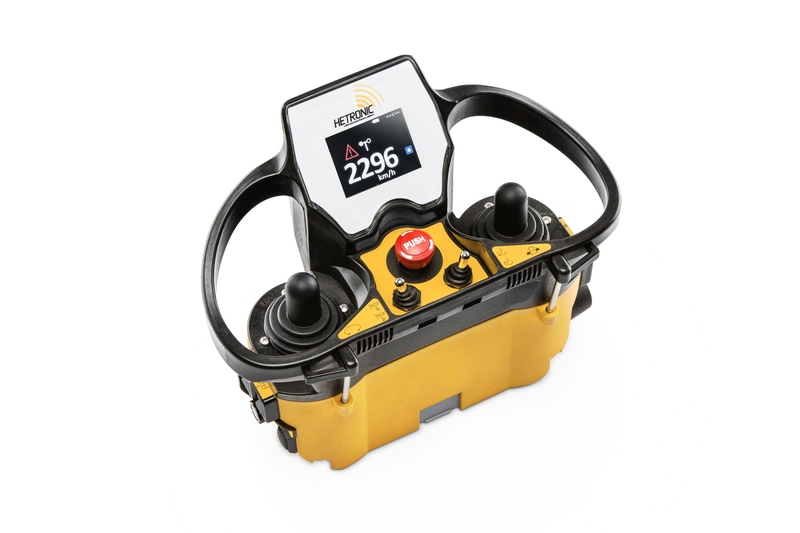 Extremely rugged yet lightweight, the Nova-XL is designed for applications that require multiple functions with either digital or proportional precision controls. The Nova-XL is available with up to 4 dual - axis joysticks(digital or proportional) or up to 8 fully - proportional paddle levers. The joysticks or paddle levers permit smooth operation without operator fatigue. The Nova-XL's panel design provides ample space for additional toggle switches or an optional graphic display. The HETRONIC GL family of transmitters sets the standard for today's industrial radio remote controls. The GL and GL-3 impresses with its sturdy and attractive design. No compromises are made in regard to functionality and operator friendliness. The GL is available with up to 3 dual - axis joysticks(digital or proportional) or with up to 6 fully - proportional paddle levers. It also comes equipped with a battery charger and 2 rechargeable batteries. HETRONIC offers the GL pre-engineered or 'off-the-shelf' for the most common applications. However, the lightweight and roomy GL is perfect for extensive customization. Contact HETRONIC and our engineering staff will gladly tailor a GL system to suit your application. Ergonomic and well-balanced, operators easily access control elements. The joysticks or paddle levers permit smooth machine operation while minimizing operator fatigue. The GL, in combination with HETRONIC's BMS-2 or modular-design receivers assures the ultimate in your machine circuitry integration. Like most Hetronic products, the GL transmitter is designed to fit a wide variety of applications. 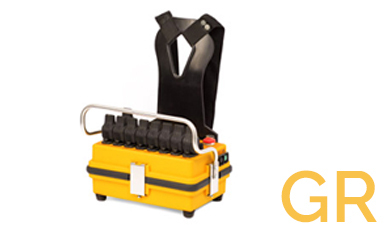 It's ideal for loader cranes, tower cranes, overhead cranes, concrete pumps and other mobile equipment. The HETRONIC GR family of transmitters is designed for industrial applications. The GR and EURO allow plenty of space for joysticks, pushbuttons and toggle switches while the lightweight design and ergonomic shoulder harness ensure comfortable operation hour after hour. The GR is available with up to 4 dual-axis joysticks (digital and proportional) or up to 7 single-axis paddle levers. It comes standard with a battery charger and two rechargeable batteries. 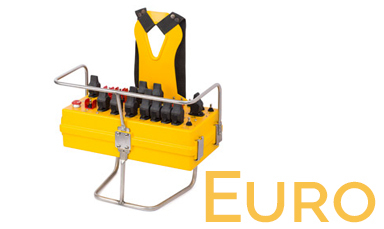 The EURO is primarily designed for tunnel - drilling machines and earthmoving equipment.The EURO allows room to accommodate numerous joysticks, toggle switches and other operator interfaces. In addition, the ergonomically designed shoulder harness provides fatigue - reducing comfort in the most rugged field environments. The GR is available as a customized transmitter tailored to your unique applications.Please note that the EURO / GR system is offered for customized solutions only. Like most Hetronic products, the GR and EURO transmitters are designed to fit a broad variety of applications. It's ideal for tower cranes, material handling, overhead cranes, work platforms, specialty applications and container handling. GR/Euro transmitters are designed for harsh environment applications where complex, multi-function control is required to safely complete the job. Hetronic GR or Euro transmitters are light weight yet offer a large control panel that can be configured with a variety of easy-to-use controls that enable operational efficiency. Hetronic GR or Euro are available as pre-configured 'off - the - shelf' or custom tailored to each customer specific application. 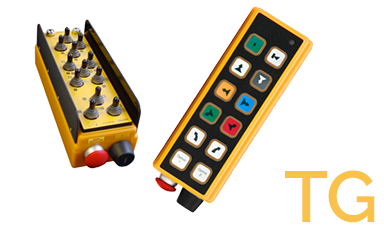 Both the pre-configured or custom transmitters can be configured with an array of joysticks, push buttons, toggle or rotary switches as well as LCD displays to meet our customer's specific work requirements. 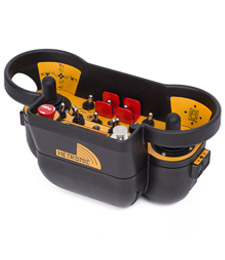 The GR and EURO harnessed transmitters are designed to fit a broad list of applications from tunnel-drilling machines to earth moving equipment, tower cranes to material handling, overhead cranes, work platforms, container handling and specialty applications. 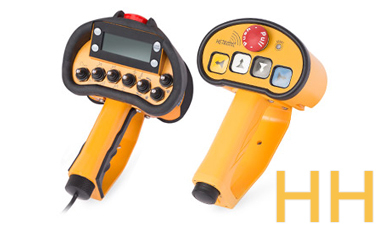 Hetronic Explosion Proof (EX) radio remote controls are designed to exacting industry standards for hazardous or potentially explosion-endangered areas. Each EX transmitter and receiver system is custom engineered to comply with local and international regulatory requirements and are approved to ATEX , IEC EX and NEC. 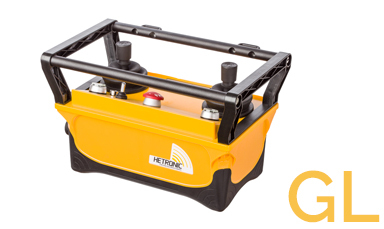 Every Hetronic system is designed and built to be intrinsically safe and will operate in the most challenging environmental and working conditions without fail year after year. Using our base transmitters, NOVA, GL, GR, Euro and ERGO, we will design and produce built-to-order systems that will withstand shock, ensure safe operation of the intended equipment and are made with the highest grade function switches, levers and and joysticks available. Hetronic Ex transmitters and receivers are used world-wide in applications ranging from mining to oil & gas platforms, petrochemical plants, grain elevators and virtually every hazardous environment industry. 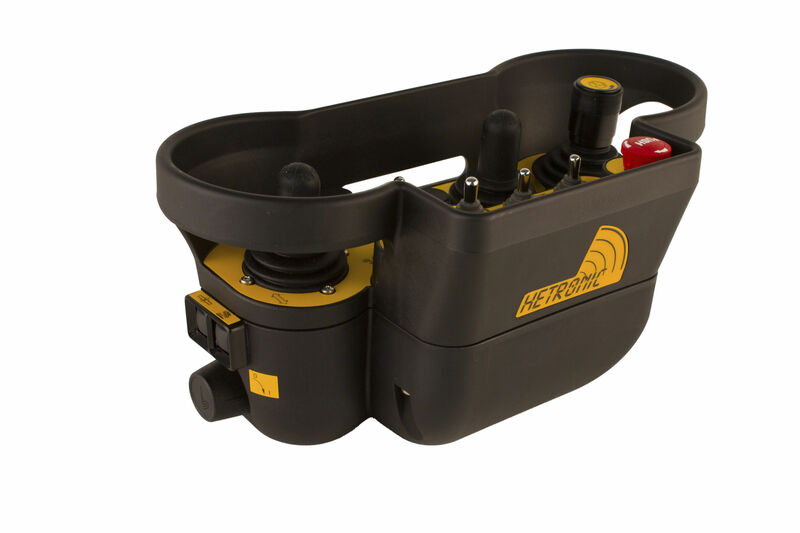 When customers need the ultimate in safe, efficient and reliable wireless transmitters and receivers to operate equipment and machinery in hazardous environments Hetronic professional radio remote control systems provide the highest value and return-on-investment.